We caught up with the musician and writer as he made a rare UK appearance at the Thought Bubble comic festival. The career trajectory of your average rockstar, it's safe to say, normally peaks with the heady heights of fame, fortune, platinum album sales and festival headlining appearances before steadily fading away and culminating in the eventual disbanding of the band some years later. Other projects may follow, however it is genuinely assumed that when you call it a day, you are stepping out of the spotlight and passing on the musical torch to the next group of misfits ready to take on the world. But judging by the huge 'meet and greet' queues of cosplaying fans circling around Leeds City Centre this past weekend (September 23rd), Gerard Way, the enigmatic former frontman of My Chemical Romance turned comic writer, is showing no sign of retiring into the background. Not only has Young Animal, the DC imprint he oversees, just hit it's one year anniversary, but thanks to an emo revival and a huge internet following, MCR are arguably more popular now than ever before. Then there's the small matter of the upcoming Netflix adaptation of his The Umbrella Academy comic series, not to mention the prospect of a second solo album on the horizon. In short, this is no average rockstar. 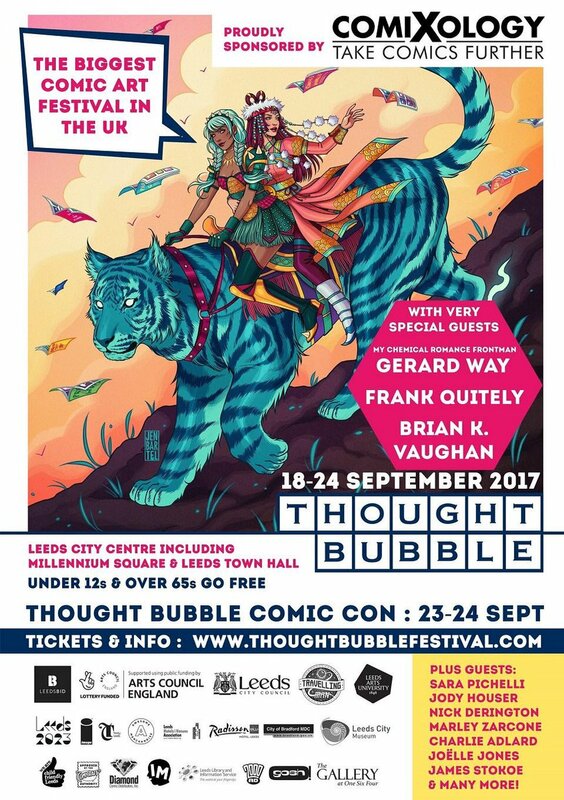 We caught up with Gerard during his rare UK appearance at the Thought Bubble comic art festival to talk through his future writing plans, working with Netflix, his swanky new music studio and what he makes of the endless growth of MCR's fandom. PopBuzz: Let's start with why you're in the UK. It's been one year of Young Animal, your DC comic imprint. What would you say have been the biggest things you've learned doing this job so far? Gerard Way: That's a great question. Well, there was stuff I kinda knew going into it but there were things that really surprised me. Like, I put a lot into the teamwork aspect and I really feel like that paid off. It does feel like a unit of people, relatively like-minded but doing really different books from each other. And that was, I think, the result of all of us going all in on teamwork and teamplaying and just working together. It was cool. PB: And like you say, there's been so many different titles. One that got talked about a lot was Mother Panic because it was set in Gotham City, home of Batman. Is that something you are looking to explore in the future? Are you hoping to make more in roads into those famous DC worlds? GW: I don't necessarily know that we're gonna do that. I think we're kind of finding our groove a little bit and realising that none of that...it's not as important to us as it was in the beginning to try to bridge that gap. I feel like we're really starting to get our own thing going. And it's nice because I kinda feel like all stories count. We're putting out really good stuff and people enjoy the stories it's like...these things do count. You don't know when things will get absorbed into a larger world, you just kinda make the books. So we don't stress that anymore. PB: Longterm fans will know that before you got into music you were an intern at DC. Is there any skills you picked up back then that have stuck with you in the new job? GW: Well doing that internship gave me a real appreciation for how comics get put together. Up to that point, I was learning the nuts and bolts of putting comics together from, I guess, the physical standpoint of drawing them and lettering them and writing them and all that stuff. But I didn't yet have an appreciation for everything else that goes into it, from an editorial standpoint...There's so much more to making comics than just making comics. So the internship gave me a real appreciation for that. PB: Congratulations on The Umbrella Academy Netflix news. You're credited as an executive producer so will you be quite actively involved or are you happier letting the director and his team take the lead? GW: I think we're still figuring that out. Everything's happening very organically and it's really happening at kind of a rapid rate and there's a lot of moving pieces. For the most part though, I'm letting them steer. I'm adding input when it's needed. PB: Originally it was developed as a movie script, so when was the decision made to turn it into a series? GW: I think the change happened when Universal finally decided 'ok we're gonna let the rights go'. Because they tried for a good while to get that to work as a film and it was just difficult. And so once the rights came back and we ended up going with UCP, which is Universal's television division, they had said 'we actually think this would really work as a TV series'. So right after that, right after the film rights got reversed back, they decided that it was time to try and make it a TV show. PB: I'm not sure how far you guys are down the road with casting but in terms of your dream casting (money's no object, living or dead) are there any actors you would love to see playing your characters? PB: He actually looks a lot like him in the illustrations. He has an Adrian Brody vibe about him. GW: Yeah and there's sometimes when you're working, you base a character a little bit off an actor. I thought of Gary Oldman a lot when I was working on Hargreaves. So there's stuff like that but you tend to leave that over time and you start to think 'who would be in Umbrella Academy today, in this year'. I think it's just about finding the right people, I dunno how much it'll be dependant on really big names. PB: Let's talk a little bit about music - you've hinted for a while that there may be some new solo material coming from you soon, what point are you up to with that? GW: Well I now have a studio. I have this, like, compound type situation where I have a place to record live music and I have a place to record music in a control room and then a place to work on my art projects and my comics. I just kind of, right now, have so many comics due and so many comics to write that I've just been doing that. I've been trying to fit music in but I've just started to kind of write music. So that's starting, it's at a very early stage. PB: You've done a couple of songs more recently that tied into your work in comics, is that the direction you see your music output moving in? 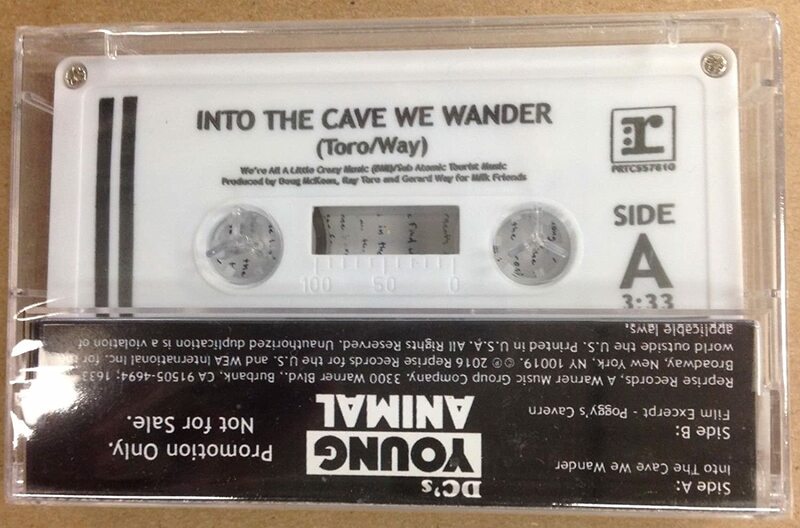 GW: Well we did a song for Cave Carson (the comic series on Young Animal) that we put out on a casette and then on a picture disc. I'd like to do more of that for Young Animal. I think that would be a great way to break in the studio. I think that the idea was getting the studio up and running to experiment making the Young Animal record. So that way we could break the whole situation in and really figure out...every studio works so different from each other but I figured that would be a good idea. And again, it's another awesome collaborative situation where you get to work with a group of people, whether it's me sat in a room with my co-producer and engineer, or me working on the record alone and then eventually bringing people in, which is what we did with the solo record. For quite a long time, it was just me putting those songs together and then we would bring in other musicians to play parts. But with the Young Animal record, if we get to do that, like Cecil (Castelluci, writer) is a musician so she'd work on a track with me and we're talking about all different people that can contribute. So that'd be fun. PB: If I could ask a couple of MCR questions before we finish? GW: Sure, I don't mind. PB: So one of the amazing things about that band is that over the last few years, your following has gotten even bigger online thanks to Tumblr, memes and streaming services. It almost feels like you are bigger now than you've ever been. Is that something you've noticed? GW: I did become aware that the band gained more life after breaking up. I mean if you think about the themes of MCR, it was almost supposed to become more powerful in death (laughs). That really fits in. PB: And how rare as well - I can't think of any other band where this has been the case. GW: It's been amazing, yeah. PB: Obviously most recently you did the reissue of The Black Parade, have you thought about any more legacy releases? Will we see reissues of any of the other albums too? GW: I don't know. We usually let the record company lead with that stuff. Basically, every once in a while they'll come to us and say 'hey, what do you guys think about doing, for example, a 10 year Black Parade release' and we'll be like 'alright, cool'. And then we're a little bit involved just from an art standpoint but don't really get involved much past that. But we have a great relationship with (the record label) Warner Brothers and they really know what our vibe is so they've kinda understood what we do. It's nice and easy. PB: There were also some pretty high profile covers of your stuff, especially around the anniversary, one of the biggest being Twenty One Pilots' version of 'Cancer'. Did you happen to hear that version? GW: Oh yeah. I did hear that one, it was great. I was really impressed. I didn't know what to expect and I was surprised by what I heard. Because there's a bit of rejuggling of parts and I was like 'wow, this almost sounds like a remix' but it's a cover by way of this, kind of, rearrangement and I was really impressed with it. I like that band anyway, I like the sound of that band. I think what they do is really interesting. So, I was psyched to hear that cover. PB: I think there's a clear line of influence with those guys too, they are definitely taking on that mantle you left behind, experimenting with similar themes and lots of different musical styles. GW: Yeah, I think so too. They're a good band. I was really psyched about that. I was into it. PB: One last question - we've chatted to your old bandmate Frank (Iero) on quite a few occassions and he told us you guys still have an MCR group text chat going. We then got loads of messages and comments from fans asking if the chat has a name. Frank said he hasn't got one on his phone, have you added one on yours? GW: (laughs). No, it's the same thing. I didn't know. We're older. I'm 40 now so I had no idea you could name a group text chat. I'm pretty sure none of us knew that. It's just our names at the top. Gerard Way's Doom Patrol comic series is available now on Young Animal. The Netflix series of The Umbrella Academy is expected to begin streaming at some point in 2018.